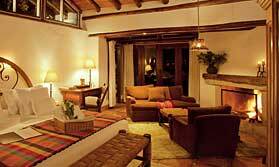 Inkaterra La Casona is Cusco's first luxury boutique hotel. The hotel has been converted from a 16th century colonial manor house, one of the first Spanish buildings in Cusco, and is built over an Inca complex. This impressive heritage is displayed in the many original features such as stonework and murals, and enhanced by antiques and artworks. The 11 suites surround an inner courtyard and are arranged over 2 floors. They are decorated in fine colonial style with antique furniture and traditional soft furnishings. Each suite has a large stone fireplace, a private sitting and dining area, and a spacious spa-style bathroom. They are equipped with individually-controlled heated floors, a safe, minibar, wireless internet and LCD flat screen TV with direct TV, DVD, iPod and free Wi-Fi. La Casona has a lounge, library, dining room and dining terrace, courtyard and inner patios. A buffet breakfast and afternoon tea are included in your stay, with lunch and dinner also available, though with a number of restaurants within walking distance there's no shortage of dining options. You have the services of a concierge as well as 24-hour room service. The on-site spa offers a choice of massage, Andean hot stone treatments, reflexology and oxygen therapy. The hotel is in the heart of Cusco, a short walk from the main square, so it's easy to explore the city sights at your leisure. Guided tours of the city, surrounding area and Sacred Valley can be organised, too, to make the most of your time. Inkaterra La Casona is a member of the prestigious Relais & Chateaux group. Open: Inkaterra La Casona is open all year. Location: La Casona is located on the Plaza Las Nazarenas near the main square in Cusco. The airport is a 10-minute drive away. Rooms: The 11 suites are arranged around the central courtyard. Each has a dining area with an open fireplace, flatscreen TV, cordless phone, minibar, safe, free Wi-Fi internet access, iPod stations and large marble bathrooms with underfloor heating and complimentary toiletries. They have views of the plaza or courtyard and are located on the ground and first floors. They are furnished with antiques. Activities Exploring Cusco, guided city tours, shopping. The hotel can arrange tours of archaeological sites, cultural trips and excursions to the Sacred Valley. Facilities: There is an elegant lounge and a separate dining room with an outdoor area. The dining room is open for breakfast, lunch and dinner. There are terraces with day beds, 2 patios and a central courtyard. The hotel has a spa offering massages and treatments. Children: Children of all ages are welcome. Children can use the Andes Explorer Kit containing a torch and coloured pencils. Health: Cusco is not a malarial area. Communication: There is free high speed & Wi-Fi internet access. La Casona Inkaterra is very active in promoting their local community. They promote local events and give guests a taste of the area by serving a wide variety of Andean dishes. All of the hotel guides come from the local community and almost of all of the employees are Peruvian nationals, the vast majority of them coming from nearby. "Lovely, characterful hotel in a great location"
"Fantastic hotel - loved it"
"Probably the most luxurious hotel I have ever stayed in, made me feel really special, treated like a princess, wonderful staff, delicious delicious delicious food, would like to move in permanently. Superbe." "We really liked this hotel, couldn't fault it. We had two separate stays and stayed in two different rooms both very nice. Staff were very helpful, polite and accommodating. Possibly one of my most favourite hotels. "